This debate, which took place at the Challenger 2012 marine science conference in Norwich, consisted of four speakers with a broad range of expertise including industry, public perceptions, marine and bird life impacts. Each speaker gave a brief presentation, which is summarised; a question and answer session followed this. First of all Paul highlighted the roles that RenewablesUK undertakes. These included acting as an industry forum and lobbying government; they are supported by a number of large commercial partners (including EDF energy and Mitsubishi). Reasons given for building offshore wind farms were that it utilises a large energy resource (potentially supplying up to 43% of the UK’s energy), creating up to 25,000 jobs in the process (whether these are predominantly permanent, high paid jobs or temporary, low paid jobs was not made clear). Image 1: Proposed sites for development of offshore wind farms (via http://news.bbc.co.uk/2/hi/8448203.stm). To provide 1 GW of power to 700,000 homes, it is claimed that 300 turbines are required. Currently the UK has 1.8 GW’s worth of operational turbines. 2.4 GW’s worth are currently under construction, 2.4 GW’s worth more have been approved, and 4.7 GW’s worth are at the planning stage. By 2020 the UK aims to have a total wind turbine capacity of 18 GW, aiming for 40 GW by 2030 (that’s 12,000 turbines, supplying power to 28 million homes): this sounds impressive, avoiding nearly £800 million tonnes of CO2 emissions according to the speaker, and would make make the UK a world leader in the generation of wind power. However, the extent of these wind farms (see image 1) appears to be quite substantial, raising the question of what the environmental impacts might be. In order to make evidence based decisions the speaker outlines the necessity to gather baseline data (What? Where? When? Why? ), to understand the risks to each population/species, and to design studies capable of detecting changes once a wind farm has been built. 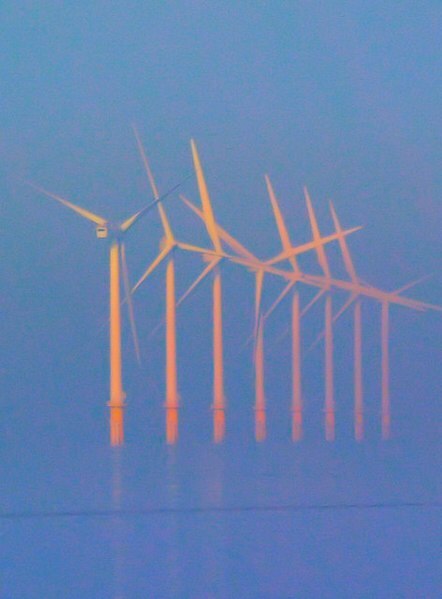 So far, studies suggest that the effects of offshore wind turbines are species/site specific: breeding terns and gulls seem susceptible to collision mortality, migratory waterbirds and seabirds tend to avoid the turbines; cormorants seem to be attracted to them, red-throated divers are vulnerable to displacement, effects on habitat are largely unknown and the energetic costs of the turbines acting as barriers to movement are variable but seem to be minor. The future challenges, according to the speaker, are to continue to research and monitor in order to improve the evidence base, to conduct monitoring studies over a longer time period, to improve modelling approaches, to assess cumulative impacts, and to look into potential ways of mitigating these impacts. This talk was fairly light on potential marine impacts; for example, at no point was the direct physical disturbance to the seabed (and associated benthic communities) from the placement of the turbines (situated on large concrete platforms) discussed. The speaker talked about how at low sound pressure levels, associated with wind turbines, fish showed a freezing behavioural response, suggesting they may avoid areas where wind farms are situated. The only other environmental impact that was discussed was that modelling studies suggest that reduced wind speeds may result in reduced wave energy – reducing suspended sediment loads and potentially have an effect on the food supply of suspension feeders. I personally wondered if reduced wave energy could reduce mixing of nutrients into the euphotic zone, potentially reducing primary productivity (just speculation!). Aside from this, the speaker pointed out that many ecosystem effects are currently unknown, and will require longer time series over a greater spatial extent in order to fully understand the potential impacts. The speaker’s other main point was that environmental concerns can be addressed at the design stages of wind turbine development (Image 3). The goal here would obviously be to maximise power outputs whilst reducing environmental impacts. The talk opened with the speaker discussing how public perception to offshore wind farms can act as a barrier to their deployment: they can be viewed as ugly, expensive, inconsistent in their supply of power, and –although they are generally seen as favourable to onshore wind farms– the public is often worried about sea use conflicts (fishing, tourism etc.). The main point leading on from this was that the public consultation phase is crucial, and if done poorly can actually become a source of contention if the public feel their views are being manipulated. The speaker was also critical of labels such as ‘NIMBY’ that are often used to distract from the content of objections (see this article in the Guardian): members of the public often have legitimate concerns, and the fear of being called a NIMBY (or other derogatory term) can reduce the effectiveness of the consultation process. Audience member: How much of the proposed areas would need to be covered to meet the 40 GW target? Paul: about 1/3 to 1/2 of the proposed zones (see Image 1). Audience member: Are any panel members willing to comment on some of their own personal views? Rowina: Once a planning system is up and running and seems to work, it often changes. I want decision makers to have a better understanding of these issues. It’s not helpful to keep moving the goal posts. Audience member: What lessons have been learnt in the UK that other countries could learn from? Audience member: Given the urgency surrounding climate change, how long before the impacts (on birds) are understood? Rowina: We have to make decisions in the absence of perfect knowledge and improve our knowledge as we go along. Audience member: What is the potential impact on commercial fishermen? Sian: There is the potential for the displacement of fishing activity – which will affect different fleets in different ways. The impact will also depend on whether fishermen are willing to move to new areas, whether they can manoeuvre their boats and gear in wind-farms, and if they are willing to risk using their equipment in wind farm areas. Paul: Fishermen will not be excluded from wind farms. It will be easier for certain gear types. As turbine designs increase in size there will be more space between them allowing for easier trawling. Loving the challenger series! Its always gutting to miss out on such broad and interesting conferences, but thanks to your posts I don’t feel quite so bad! Keep it up!